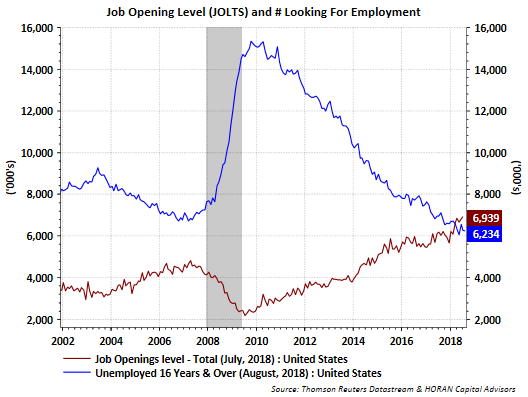 The Labor Department's release of the Job Openings and Labor Turnover (JOLTs) report this morning is further confirmation of a strong labor market. The NFIB Small Business Optimism report I highlighted earlier today also noted the difficulty small business are having in filling open job positions. The JOLTs report continues to show the number of job openings exceeding the number of unemployed individuals. This unusual occurrence has been the case since March of this year. 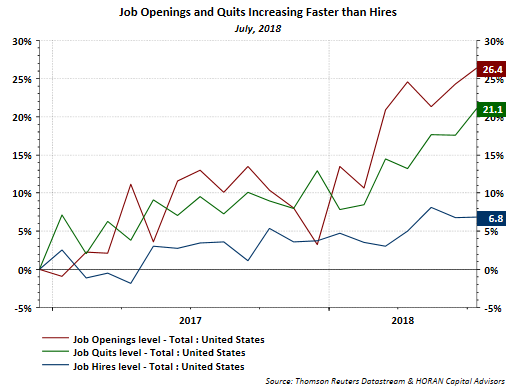 Also compounding hiring issues for companies is the fact the rate of job openings and job quits is increasing at a faster pace than company hires as seen in the below chart. 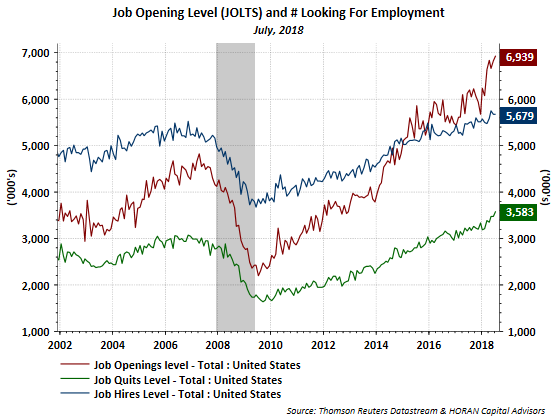 The next chart shows the absolute number of openings versus quits and hires and clearly openings appear to have accelerated. The NFIB report and the JOLT report are reflective of a tight labor market with the likely result of continued upward pressure on wage inflation. The Fed will certainly take into account these tight labor market reports into future rate hike decisions.